Whether you intend to tow your mainline out with an electric kontiki, kon tiki bag, raft, surf ski or kayak Paul's Fishing Kites have everything you need to get you productively fishing. Our 100kg mainlines have no knots in them. The pre-stoppered hook sections are double crimped into the mainline with the loops protected by a plastic tube. Our joining method ensures the mainline is not weakened by knots. 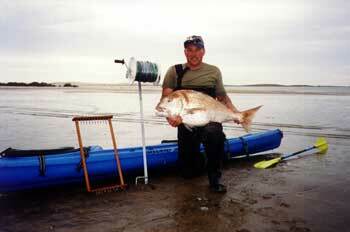 This fisher caught a 28 pound snapper at the top end of Muriwai Beach fishing into the Kaipara Harbour. He uses the kayak to tow the kontiki mainline out. This rig is ideal for motorised kontikis, fishing submarines or kontiki rafts. Extremely strong, durable and abrasion resistant. Perfect for getting way out and into deeper water. Ideal for shallow areas. An ideal rig for all kontiki rafts and submarines. The 100 kg mainline is extremely strong and abrasion resistant. Expertly assembled with double crimped joins for added security. A great rig for the do it yourself handyman. This rig has the all important mainline wound onto the reel with all joins expertly crimped for strength and security of your kontiki. All the basics you require to get you fishing up to 1000 metres offshore. Tow this rig out with your kontiki bag or raft. The strength of the 100 kg mainline provides security for your system.